This story was inspired by the prompt for Magpie Tales this week but is really about the oil spill in the Gulf. I feel so sad about it I almost feel like I’m turned to stone. I’d like to dedicate this story to my dear friend, Heather, whom I know is deeply saddened by the oil spill. As we all are. Dealing with human folly was like constantly setting out from the same shore. You took the boat out every day, watching the oars cut through shadows cast by trees, smelling the wind full of salt and sometimes stillness, sometimes fury. Every day, every blessed day the journey was the same. It was never complete because it could never be complete not until the entire human race listened and heard at exactly the same time. Agnes’ wings were damp at the edges. The wind was spitting brine. She could see eddies of malcontent beneath the water. For the thousandth time she wondered at her decision to come to earth; she hadn’t fallen, she had descended, but she was earthbound nonetheless. She had thought she could help. All the angels who had descended had. She couldn’t interfere directly in the path of human existence but she could suggest. Strongly. At times it was a challenge. Even she, a divine being formed from starlight itself gave way to feelings of despair. Agnes was worried. The angels who followed the Ancient One – a being more god than spirit – the one the humans called Mother Earth – were in revolt. There had been three killings. Immolation. Men not with blood on their hands, but oil. It was more than a sin for an angel to kill a human. It was a door closing for eternity. Agnes could not bear to think of those beings of the the light crawling through the dark forever. There would be no death. No forgiveness. She had another thing on her mind. Just as bad. Maybe worse. For some immortality was a curse. On earth. The repetitive nature of human history became harder to watch with every passing century. There was a way out. They all knew it. It wasn’t death, it was stasis. Born of sorrow, of the shapelessness of loss. The angels who could no longer cope with life on earth turned themselves to stone. 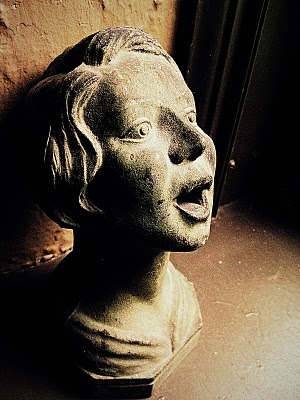 Agnes saw them every day on church walls, in gardens, on the roof of the Supreme Court. She had known them all. Those that remained were afraid. It was hard to see a creature born of hope give up. It was hard to say the word that must never be said. The streets were made of glass, waiting to shatter beneath her feet. They were more luminous than a lake frozen solid, glistening with all the sighs of all the faces in the world. She found Muriel in the park by the water, kneeling at the feet of a stone angel. It was Temperance, the angel of the elixir of life. She was newly turned, her hands were still warm. Agnes saw a flicker in the shrubbery, heard a cruel laugh. It was one of the fallen, enjoying bearing witness. Get up, she said to Muriel. Get up. Across the water it appeared as if the city was dissolving into the sea; neon, concrete and steel staining the shore cinnamon and cobalt. If Agnes wanted it the world, the entire world would crumble right here, right now. And be no more. Agnes had been swimming with the whales at midnight. She had seen Euclid paint circles in the sand. She had seen a poet named Keats write of beauty and love as he coughed blood into his hands. Agnes had seen the Four Horsemen ride out more often than she cared to remember. She had seen people dying, animals dying, lands dying. For nothing at all. But she had heard music and laughter and birds singing in the dawn light. And she had heard the waves caressing the shore. Agnes wanted to tell the angels turned to stone that love was enough to conquer devastation and fear, but she could not. Sometimes nothing was enough to keep out the dark. Even knowing that Agnes wouldn’t give up. Don’t give up, she whispered across the water. The water prevailed. There through it all, always, like armor, a talisman, a nest, the question, the answer, how it began, but not how it ended. Not yet. Agnes stood at the water’s edge, calling to her sisters, her brothers, the lost, the found, the people of the world one and all. Hands were linked across the world. Together they stood at the water. No matter how bad, they would be there. Forgive us, Agnes whispered. We know not what we do. Her whisper fell down like stones, like words, like tears into the water. She closed her eyes and held on to hope. This is how you learn to pray, she said. Her whisper rose, the breath of the smallest child, weaving like ashes in wind. She held out her hand and the whisper came back to her, forever changed by the water, but in the end, still hers. In the world to change the world. Oh, Selma. Words can’t say what this story means to me. I am so, so, SO lucky to know you. Thank you for this. I love you, my friend. I do like the way you write. I’ve always thought that the mark of a real writer is not only the telling of a story but the ability to make the reader SEE. What a way you have with words! Great fantasy with a very effective tie in to reality in the conclusion. WOW. What a kind thing to say. I really appreciate that because I do strive for that. Thank you so much !! I really appreciate such positive feedback. I also appreciate your visit. Nice to see you! I’m glad I got there in the end. Sometimes it is a challenge to blend the two. Thank you so much. Nice to meet you! love the beautiful images your words paint. oh you have woven a beautiful tale…with fanciful imagery…and it seems along the way you brightened the day of a friend…i’d say that is just about perfect. smiles. Selma, this is superb. You write with such depth and imagery. Superb! I guess I’m trying to say there is horror in the world – extreme horror – but there is beauty too. We just have to hold on to that at this trying time. It means a lot to me that you liked that bit. Thank you so much. I shall check yours out shortly. I really appreciate that because you have such a grasp on imagery yourself. Many, many thanks. Oh Selma! I ♥ this piece SO VERY MUCH. Thank you for your never-ending support. I am so grateful. You are the best! A beautiful story – I have a soft spot for angel tales. You are very poetic and lyrical in your writing style, and great imagery but your endings are what I like the best. We can’t use the excuse ‘we know not what we do’ much anymore – we know what we’re doing and do it anyway because it’s what we are used to doing and change is not so profitable for the mining sector. Good one Selma. Yes, Selma, how much we try to change and really stay the same. But Agnes is right, hope is what gets us out of bed each day to face our lives of repeated follies. Oh by the way – you’re today’s post at She Who Blogs. Oh, and I loved the cupcake post! A beautiful tragic tale for our times. You leave your reader with hope. The story you wove engaged me from start to finish. Excellent Magpie. Excellent tribute to the Gulf. Love love love it! This was an amazing and beautiful story! Yes, we must be in the world and of the world to change the world. Thank-you for this gentle reminder. Your comment got lost for a moment there. The spam filter on WordPress is weird sometimes…. Thank you for saying that. It really fits what I was trying to say. I love stories about angels too. It’s true. We are aware of what we are doing and have been for a long time. There is no excuse anymore. Hope is crucial. I cling to it. It makes me think change is possible. Thank you so much for saying that. A terrible thing has happened but we must hope something good comes from it. It was so nice of you to leave such wonderful feedback. Thanks for stopping by. Awww. That means a lot. Thank you. I am so glad you liked it and doubly glad you had fun at the conference!